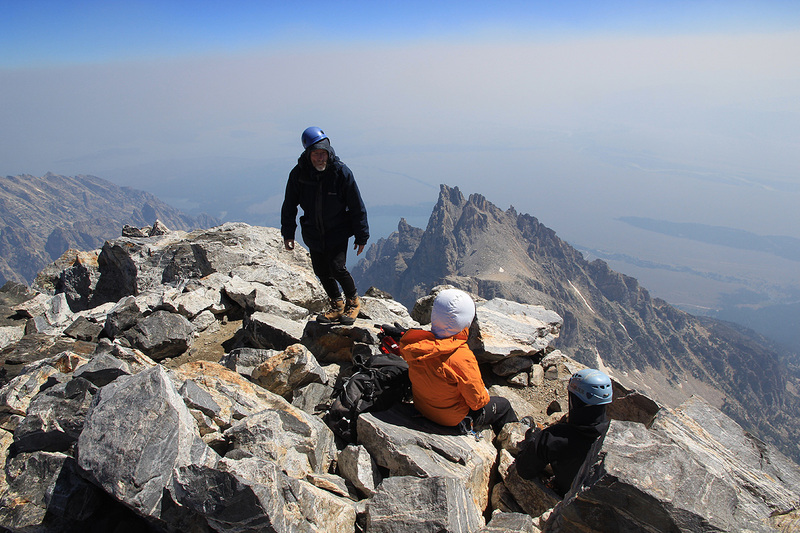 There is no permit needed to climb the Grand Teton, however there is a very strict permit system for camping. As most parties would like to start from a camp, this becomes an important issue. 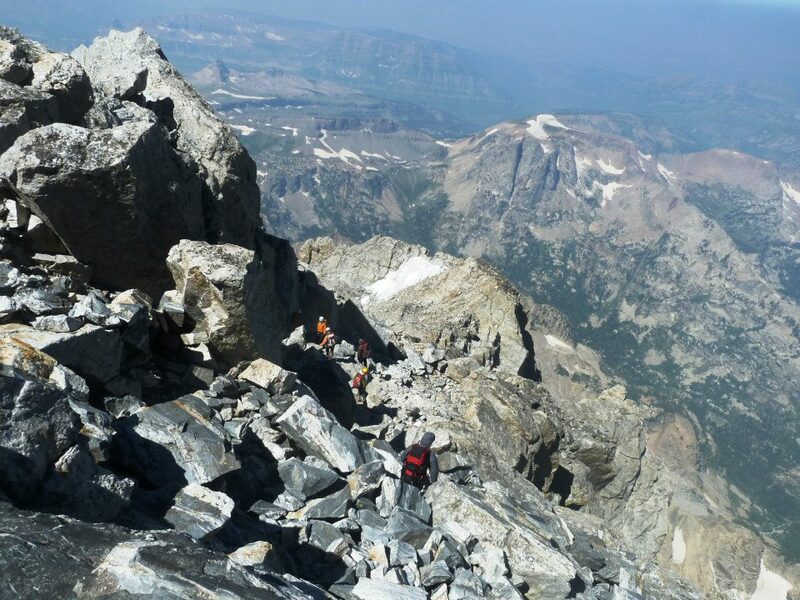 I sent an application in April for an early August climb. The reply was not very encouraging, they moved our planned summit day out one day, then granted us a camping permit for the lowest campground only (Garnet Canyon). US National Parks are generally quite unfriendly to visitors from overseas, my worst experience is Glacier National Park, while Rainier stands out as exceptionally service oriented. There is a US dollar 25.- entrance fee for a vehicle to enter the park, this is good for 7 days. In addition, there is another dollar 25.- for reserving a camp site. 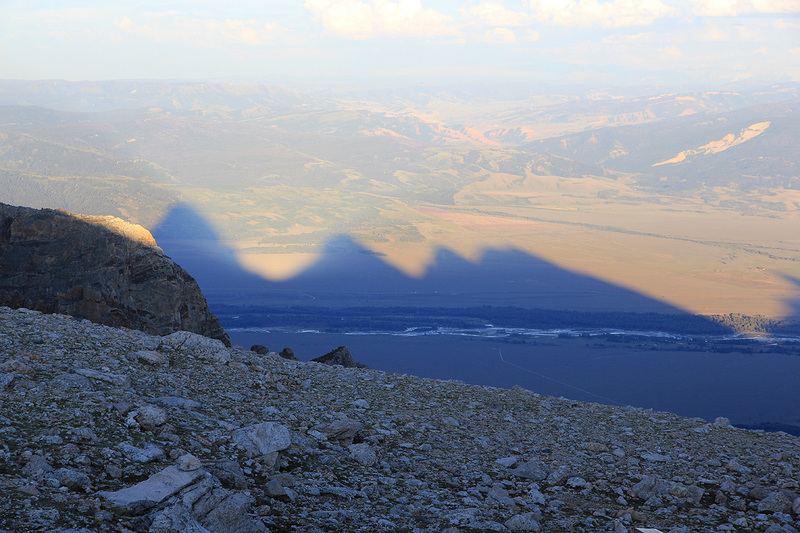 Thus, an unguided ascent of the Grand Teton carries a cost of dollar 50.- in fees to the National Park. 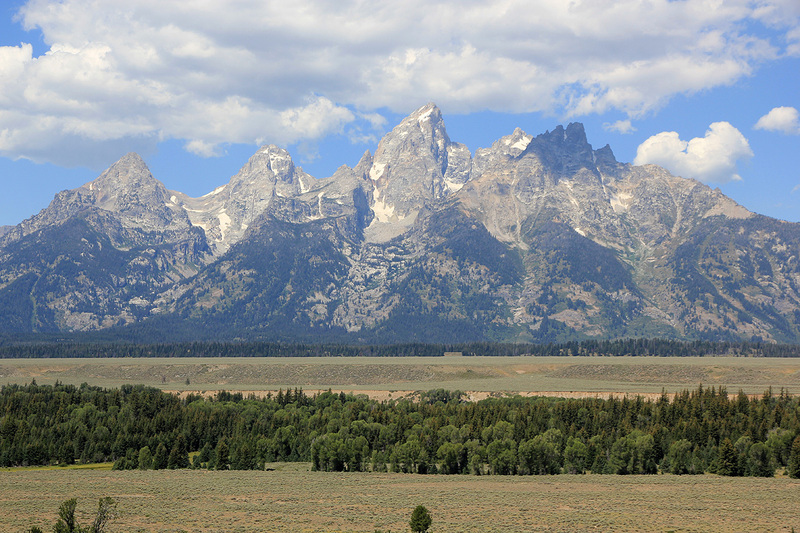 The Grand Teton is located in the Grand Teton National Park in the state of Wyoming. This is in western Wyoming, just north of Jackson. 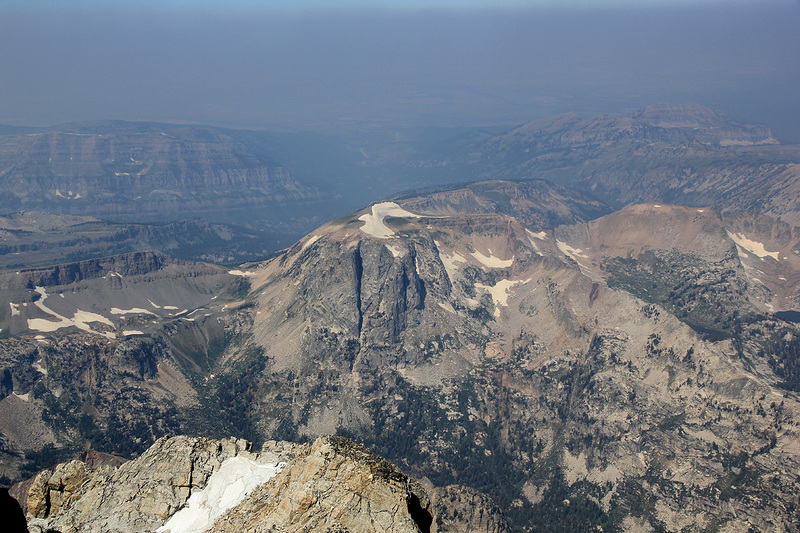 The famous Yellowstone National Park is just to the north. 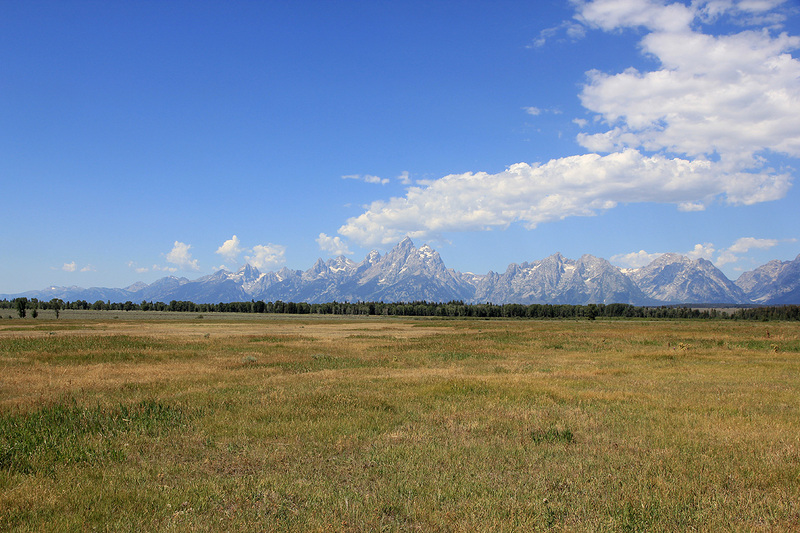 Drive north from Jackson (US 29/89/191) approximately 12 miles, turn left for Grand Teton National Park and follow signs for Lupine Meadows parking and trailhead. This location is N43:44.139, W110:44.466, elevation about 2060 meter. Photo credit and copyright Rob Woodall for the climbing pictures. The trail starts at the south end of the parking area. Follow the very big trail south, then gradually more west as the trail starts climbing a moraine ridge that connects with the main mountain slope. 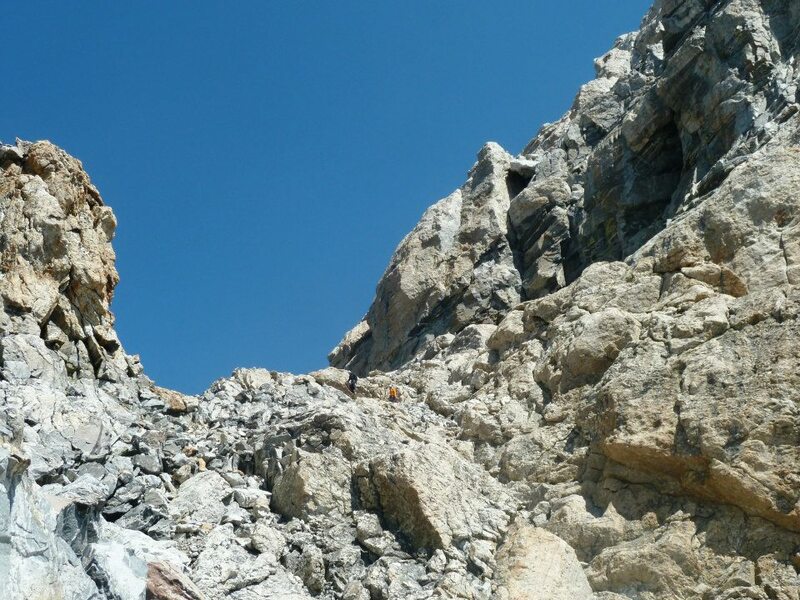 The trail continues to climb the main slope in several long zig-zag turns, before it turns more west and enters the Garnet Canyon on its north side. 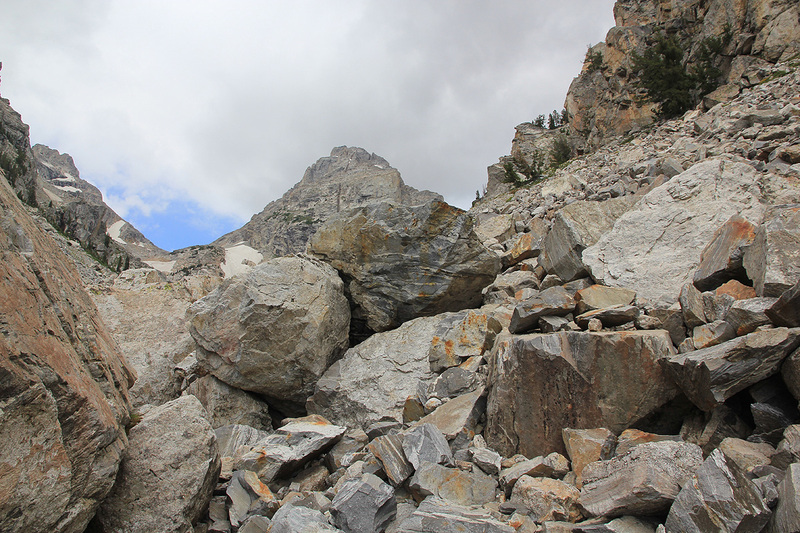 Next, the trail stays right and enters a section with huge boulders. The trail continues on the far side and continues to the Meadows. Pay attention here, the main trail seems to go straight ahead where there is camping. 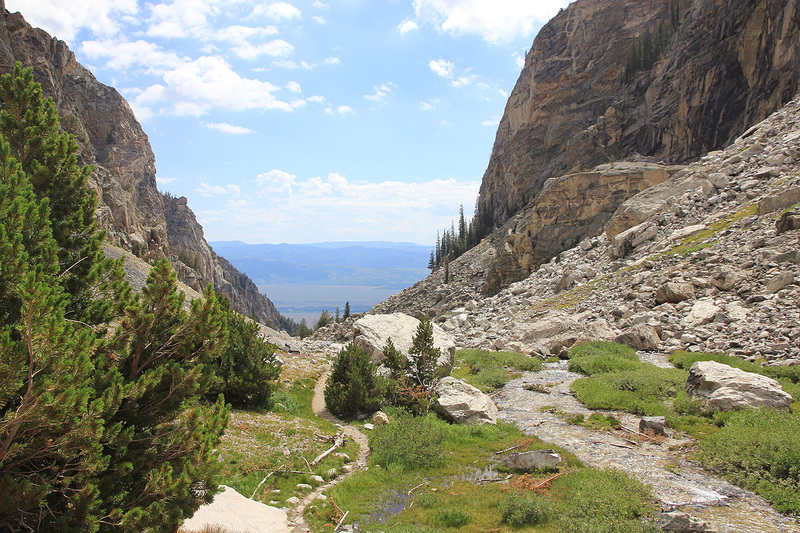 The trail to the Grand Teton/Lower Saddle forks right before the small creek and climbs the hillside on the right hand side of the basin. 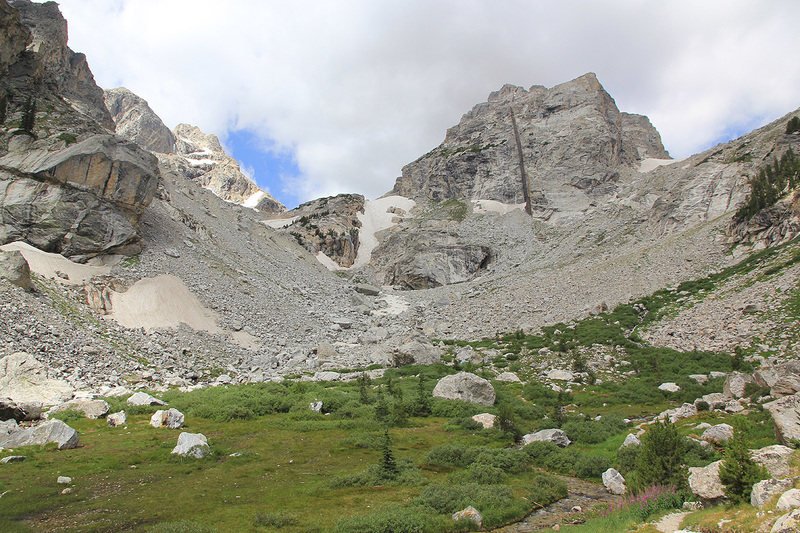 The trail gains considerable elevation here before entering an upper basin full of rocks and moraines. This is an area where one may again loose the trail. 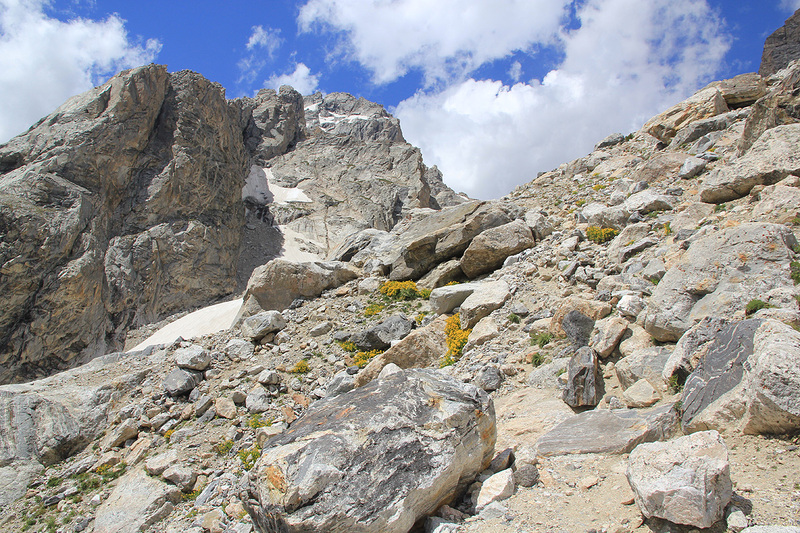 There are a few variations as the trail connects across to the moraine. 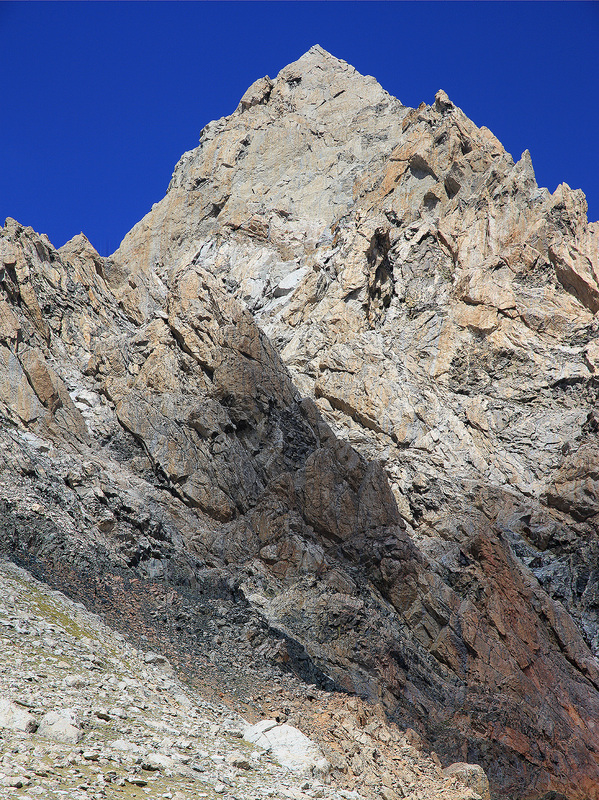 Higher up, the route climbs up a pretty distinct crack, this provides access to the Lower Saddle. There is a fixed rope hanging down this crack, the passage is (YDS) class 3. 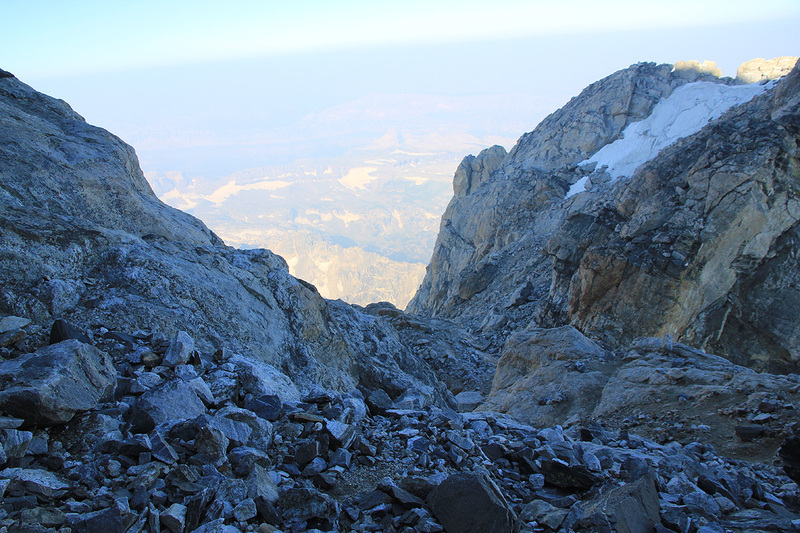 From the top of this crack, all that remains is a final slope with various trails leading uphill among the rocks. 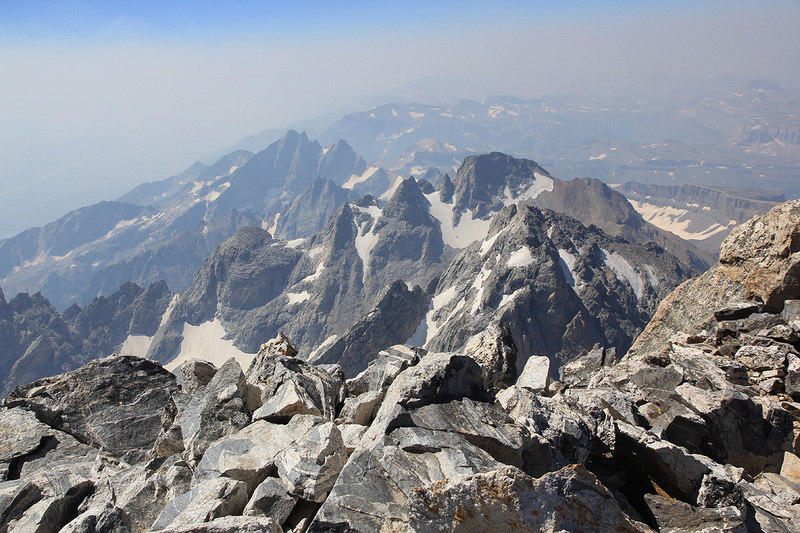 The Lower Saddle is really the highest suitable camp and also by far the best place to camp in preparation for an ascent of the Grand Teton. The location is N43:44.097, W110:48.636, elevation about 3560 meter. 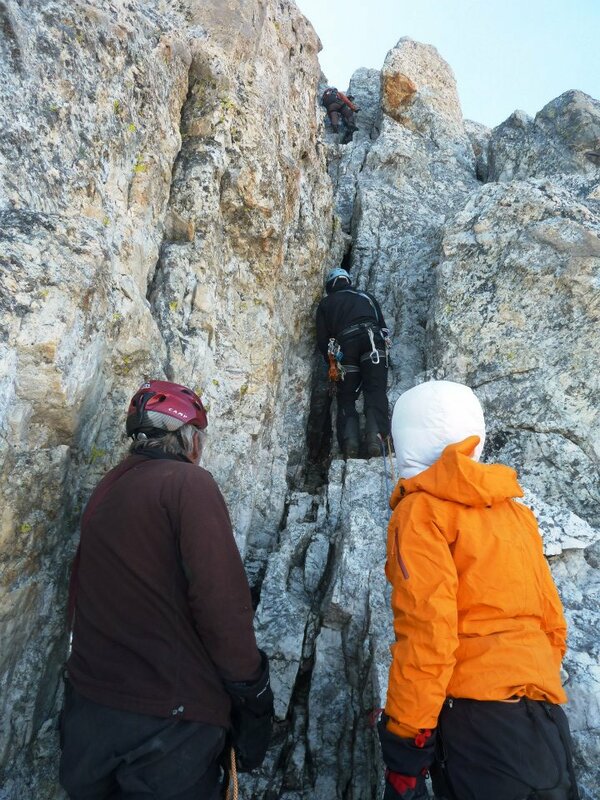 This climb can conveniently be divided into two sections. 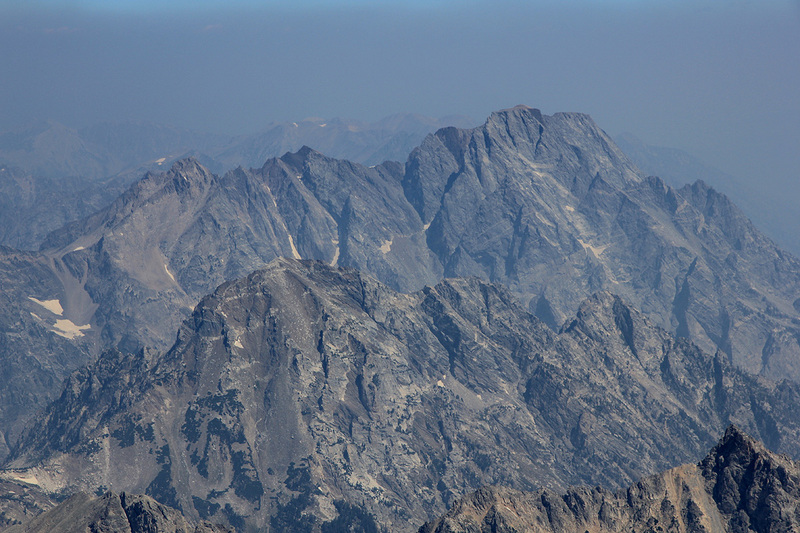 First, the route from the Lower Saddle to what is called the Upper Saddle. 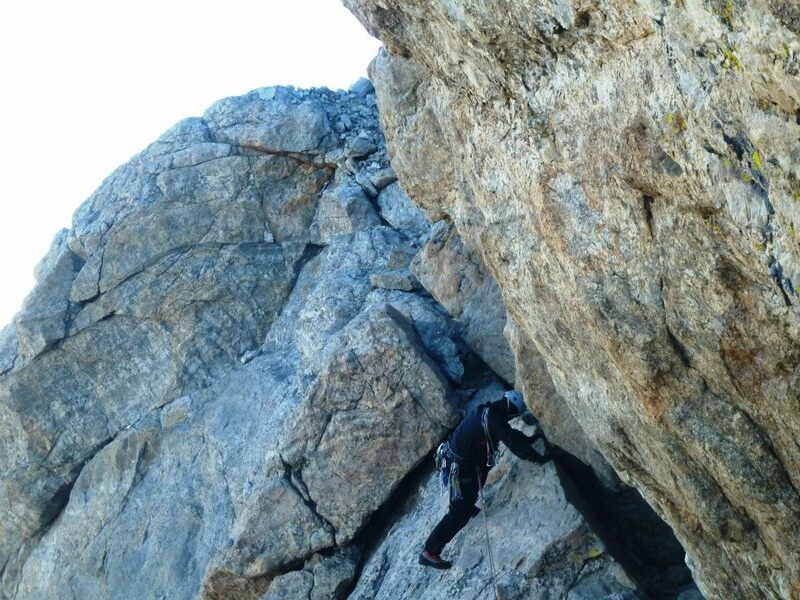 This section is a hard scramble, mostly (YDS) class 3, but with a couple of class 4 moves. If one gets off route (which is easy! ), the terrain can quickly turn quite difficult. 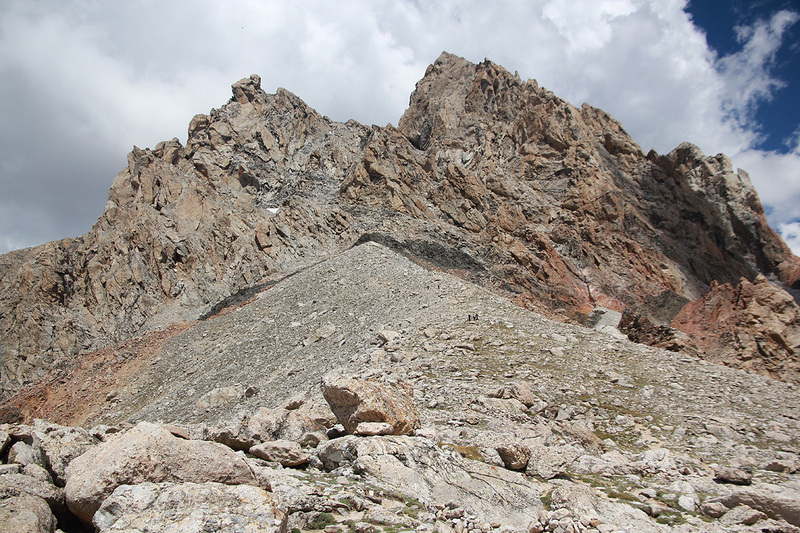 First, ascend from the saddle along a climbers trail up the moraine like ridge that connects to rocks higher up. 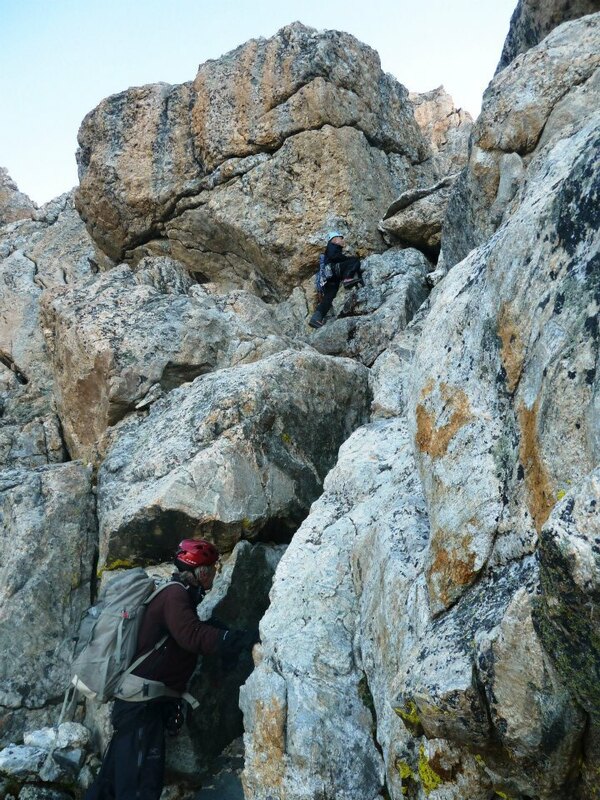 Cross through a distinct black rock band, then continue uphill on the left hand side of a very noticeable rock buttress. 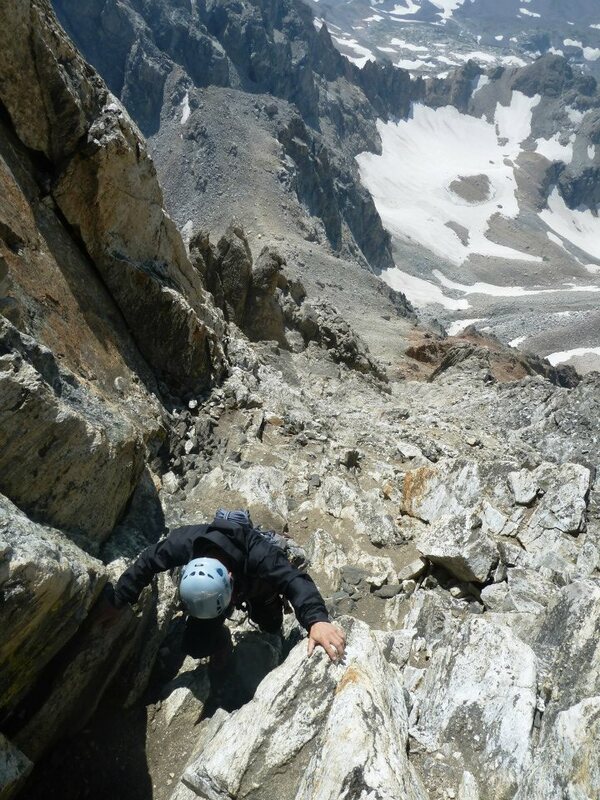 Continue on slabs of rock in order to bypass a chockstone. 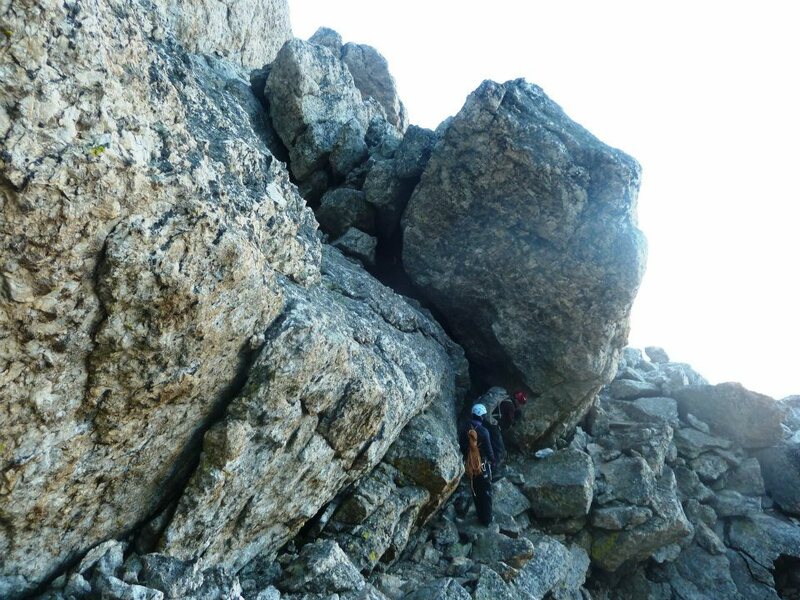 Higher up, there is a rock wall that needs to be bypassed. There are several ways to do this. 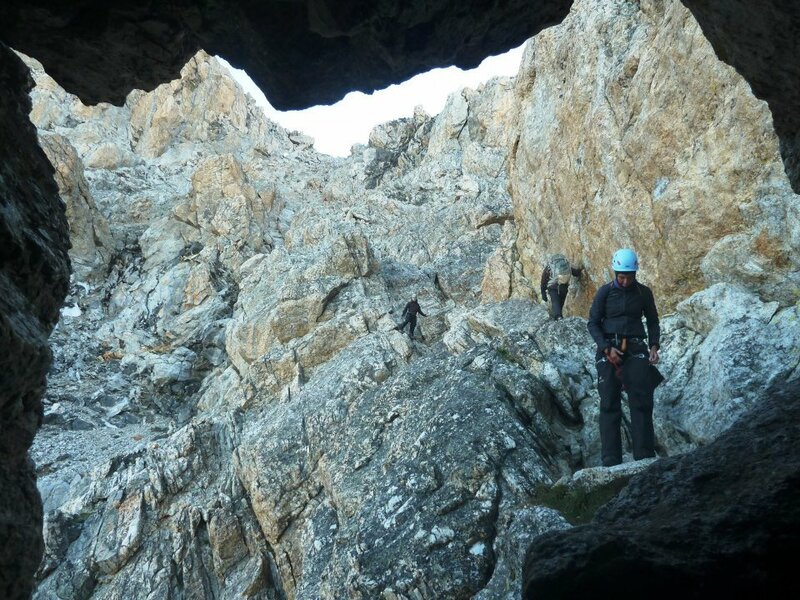 The standard route "threads the needle", this involves going right to find a traverse on a small ledge, then turning back left through a tunnel which in turn, provides access to the terrain above. (pic from descending.) We did not follow the standard route to the needle, but did so on descent. 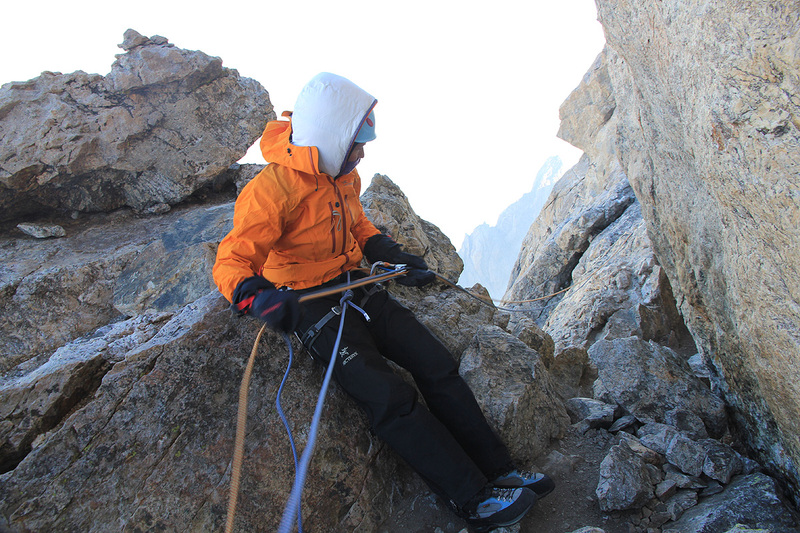 Above here, the best climbing stays more or less on the ridge and avoids the wide gully on the left side. There are several ways and one should find more or less helpful cairns guiding the way. Care is needed in several places as this is generally a route in steepish rock. 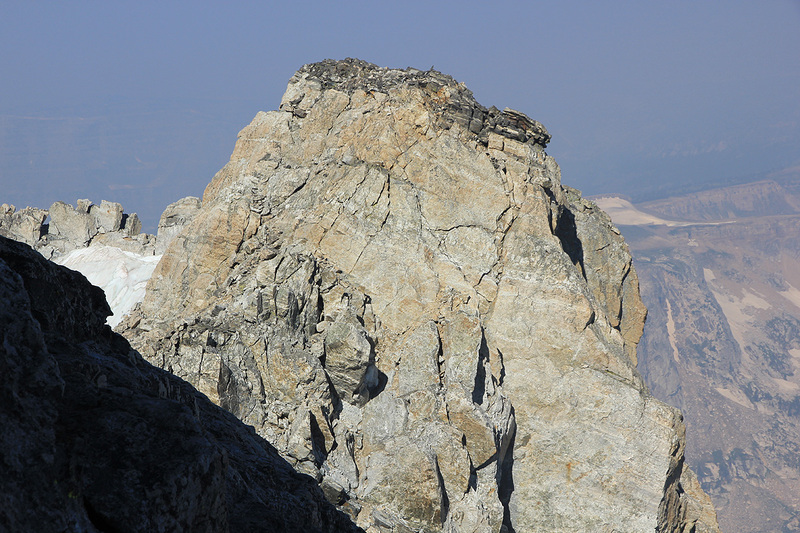 The terrain gets easier near the top as this route ends up in what is called the Upper Saddle. From here, the Grand Teton really towers above. In fact, there is a significant overhang directly uphill from this area. You are now at location N43.74097, W110.80454, elevation about 4060 meter. About 140 vertical meter to go. 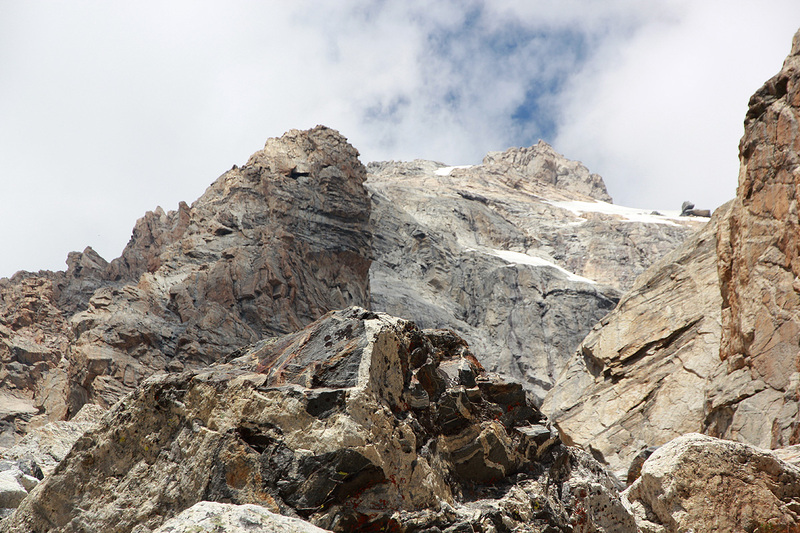 The second part of the ascent starts from the Upper Saddle. This is the climbing part of the Owens Spalding route. 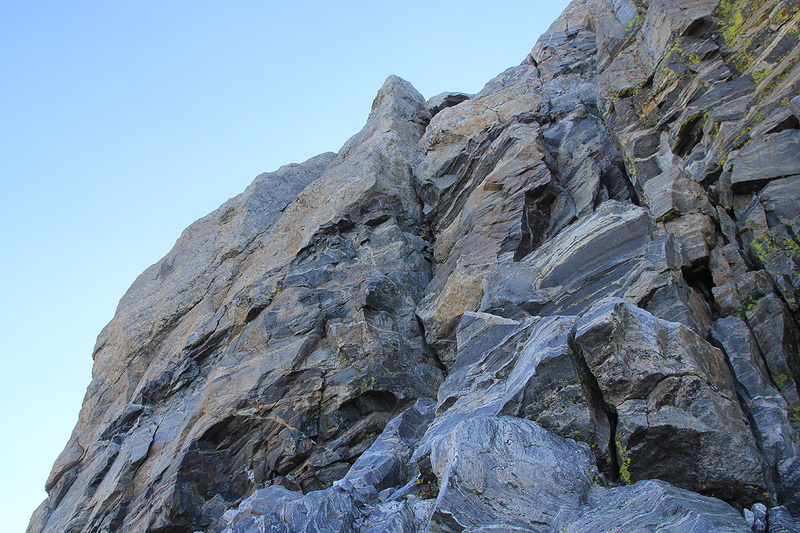 The first pitch is relatively easy, starting up towards the cliff and traversing out to the left. 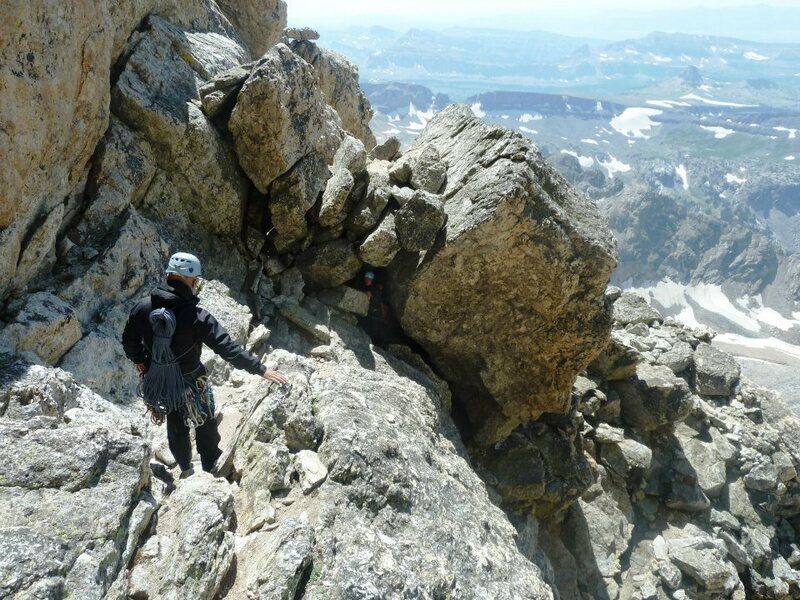 The route quickly becomes exposed as one moves out in the pretty impressive north-west face of the Grand Teton. 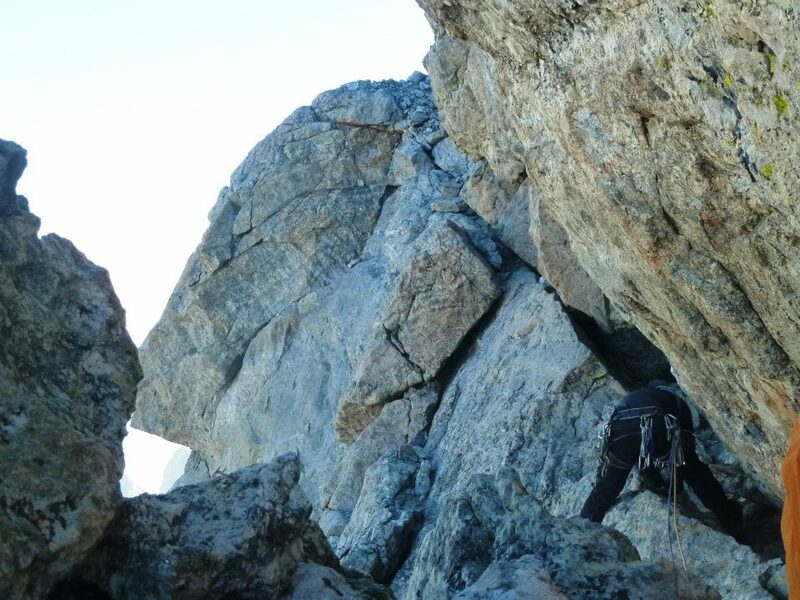 The second pitch is quite entertaining, first the famous belly-crawl, followed by an exposed hand traverse to get around a corner and into a nicer spot. 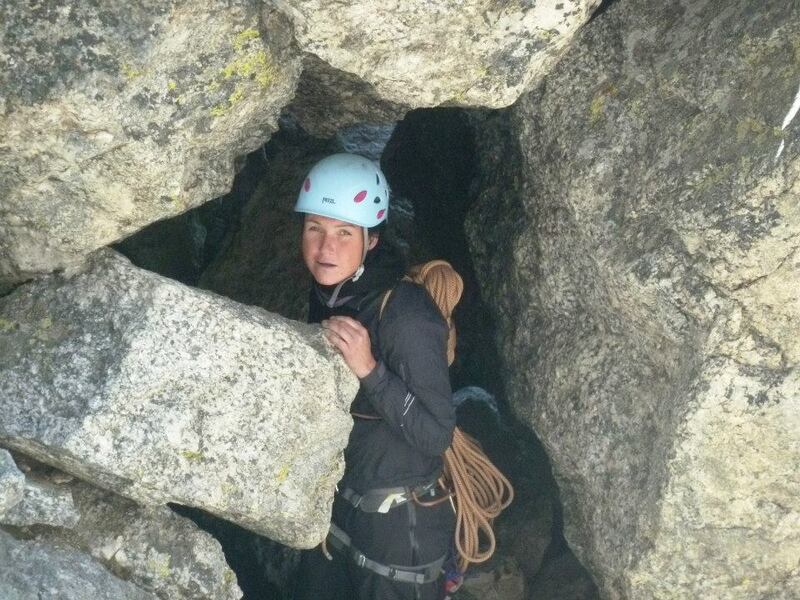 Next, there is a tunnel below a big rock structure which one subsequently crosses on top, before finishing up slabs. 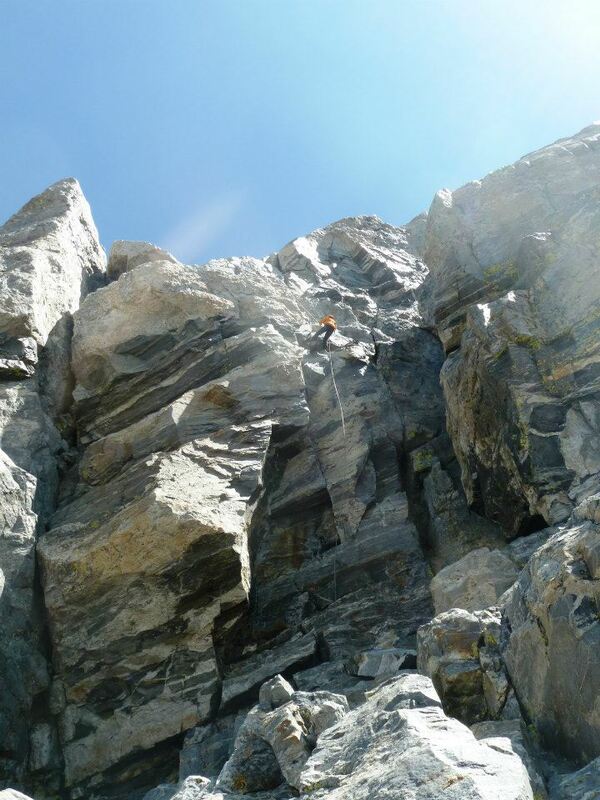 The third pitch is a chimney, fairly steep, with variable holds. 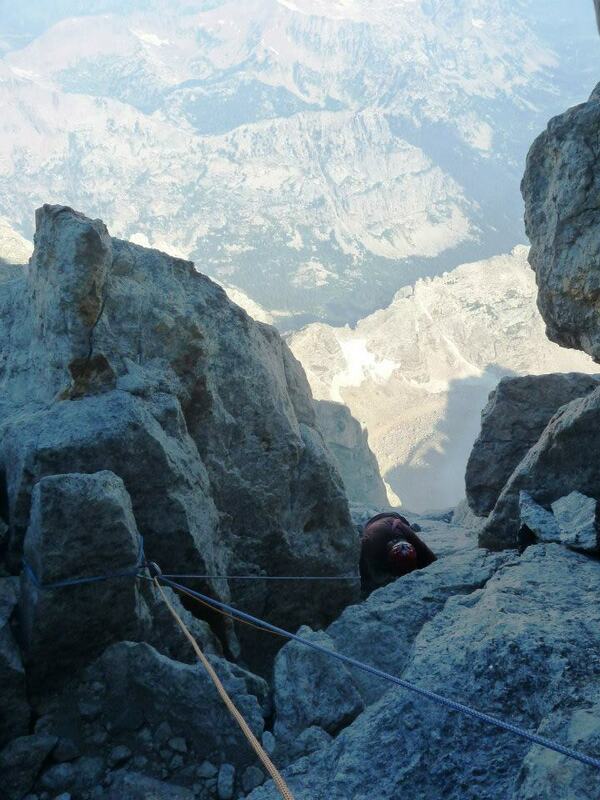 This pitch ends on a pretty large ledge from where a long rappell can get one directly back to the Upper Saddle. 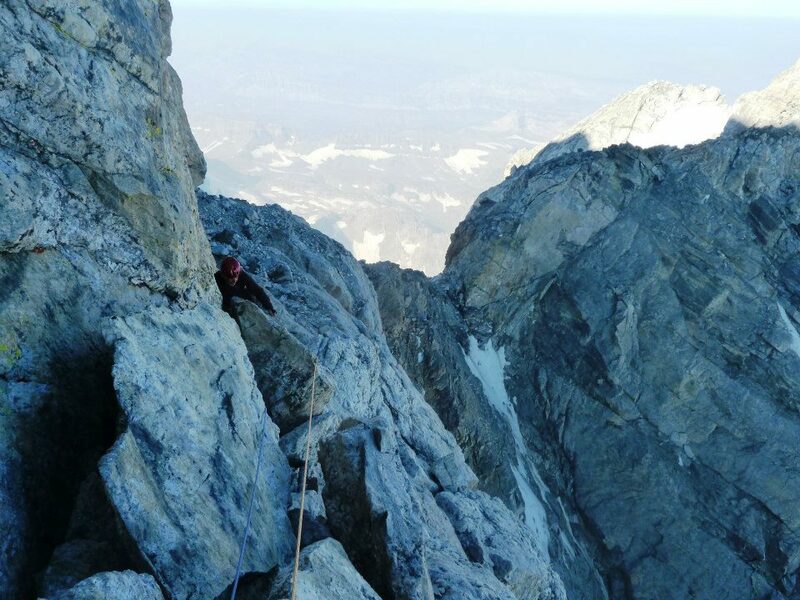 The fourth and last pitch runs up a gully that steepens near the top. Eirik encountered some ice on the normal way and moved up a bit further right instead. This was likely the single hardest move of the climb (small holds). 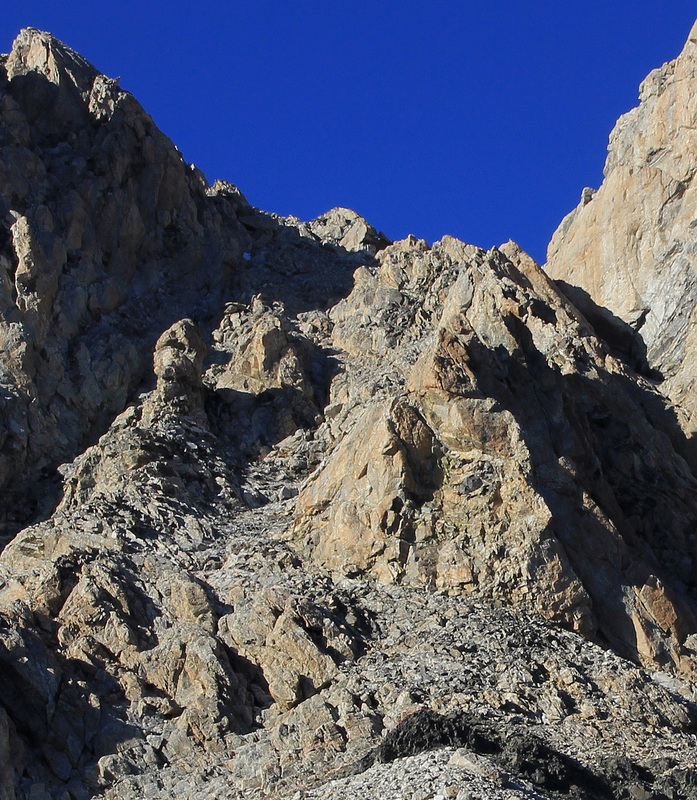 A slight complication is that parties also abseil down this same gully (see pic.). 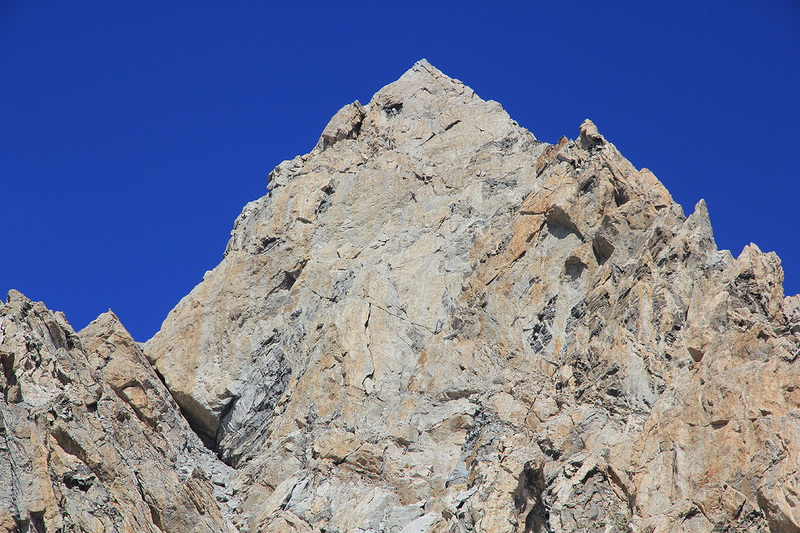 Above here, one generally unropes and continues to the summit by (YDS) class 3 scrambling. There are a few variations, again not all routes are equally easy. Descending, most parties do an abseil down the gully that was climbed as the last pitch. 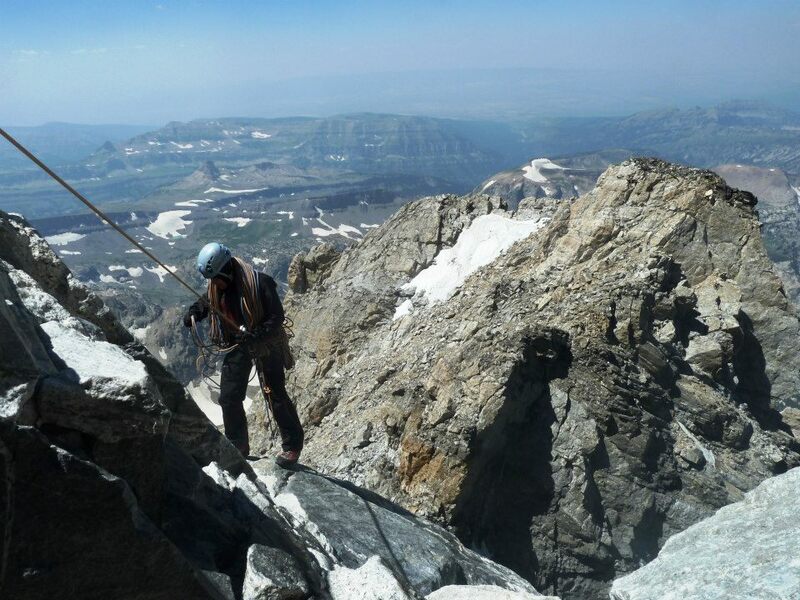 Below there, descend on a natural ledge and move left until you locate a fixed anchor (2 bolts) that can be used for a long rappell all the way to the Upper Saddle. 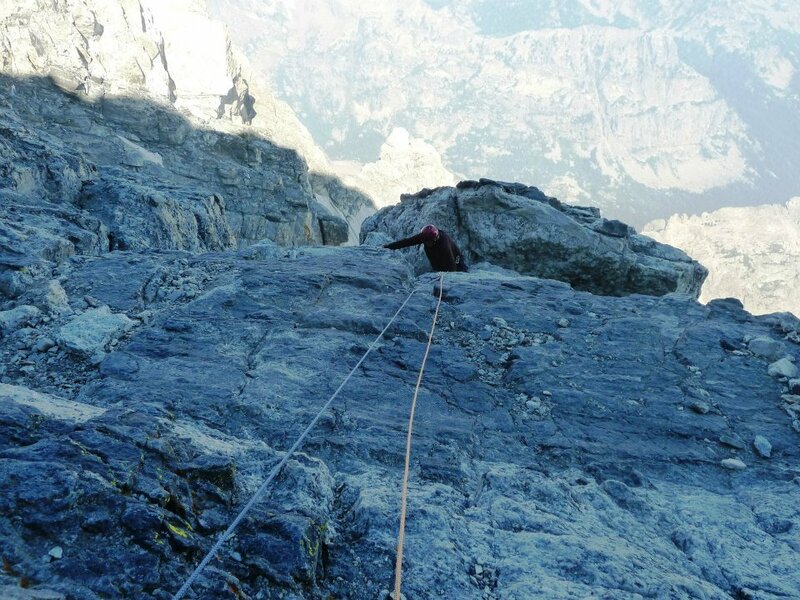 One should be aware that this abseil runs straight down the overhanging cliff, thus is a free air rappell the last 10 or so meter. 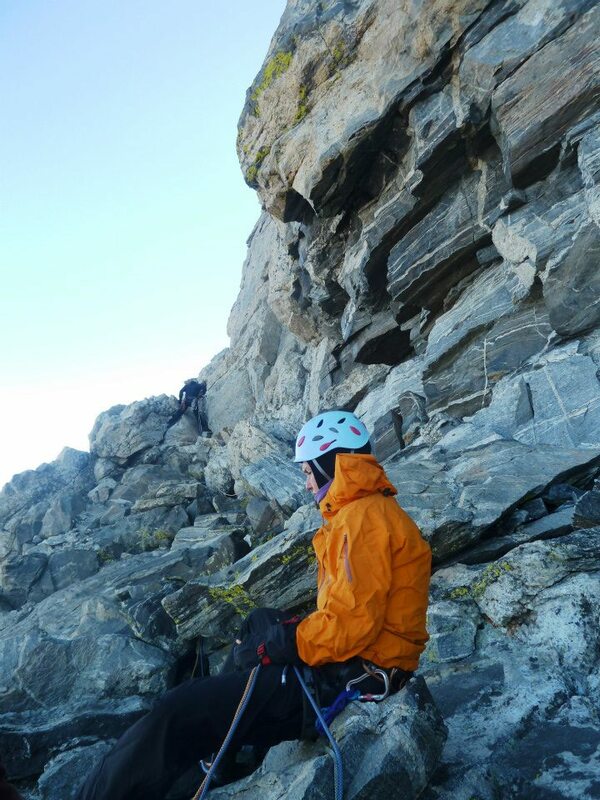 The climbing described above, is technically not very difficult, but may depend a bit on the current conditions. 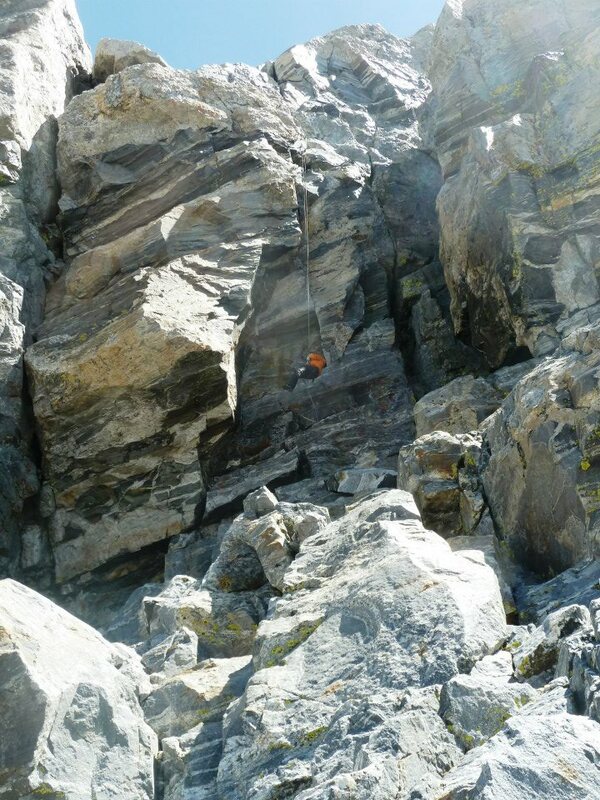 We had an icy patch on the last pitch which made me give a (YDS) class 5.5 to characterize the most difficult move. 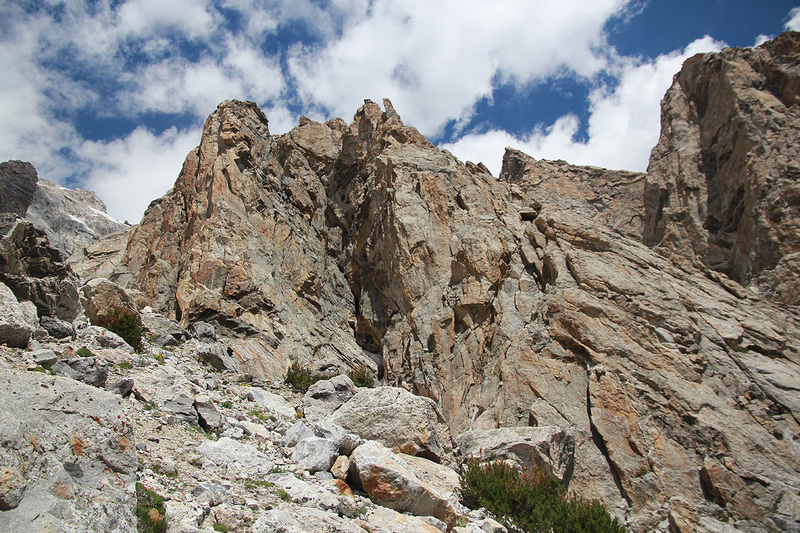 The route has plenty of exposure and should not be the very first place/route to be climbed. 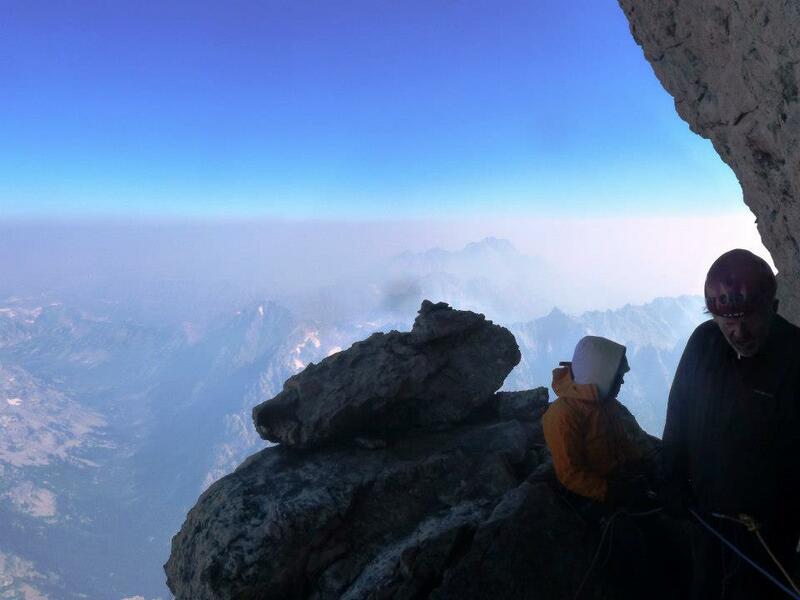 This is a real mountain, not an indoor climbing gym. 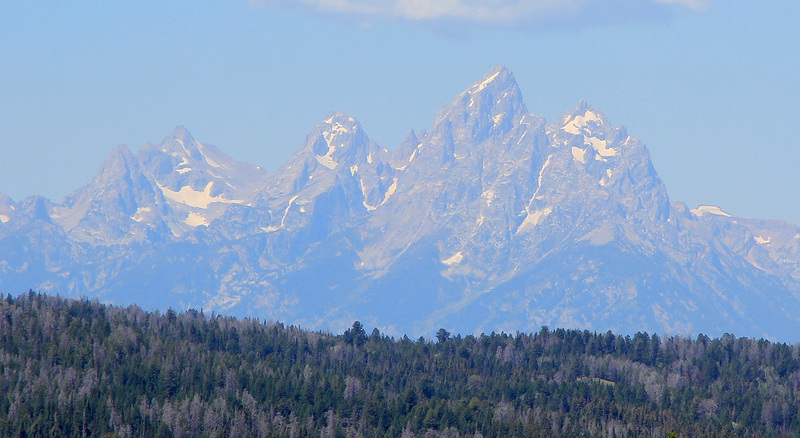 We drove to The Grand Teton on July 30th., the day when we hiked out from our climb of Gannett Peak. 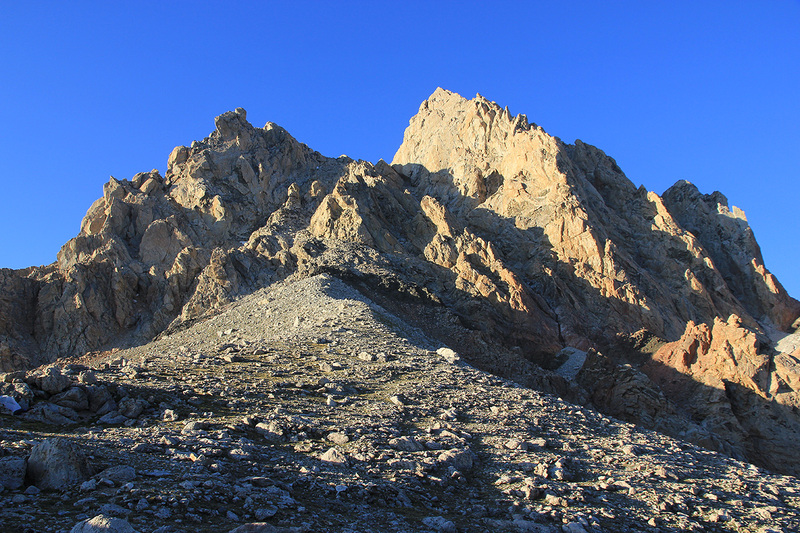 We had a permit to camp in Garnet Canyon on August 1st. However, I wanted to check in at the ranger station and ask if we could upgrade our permit in order to get a better high camp location. We arrived at the climber's ranger station (next to park headquarter/visitor center) in early afternoon and I quickly got served by a very professional and friendly ranger (nick)named Drew. 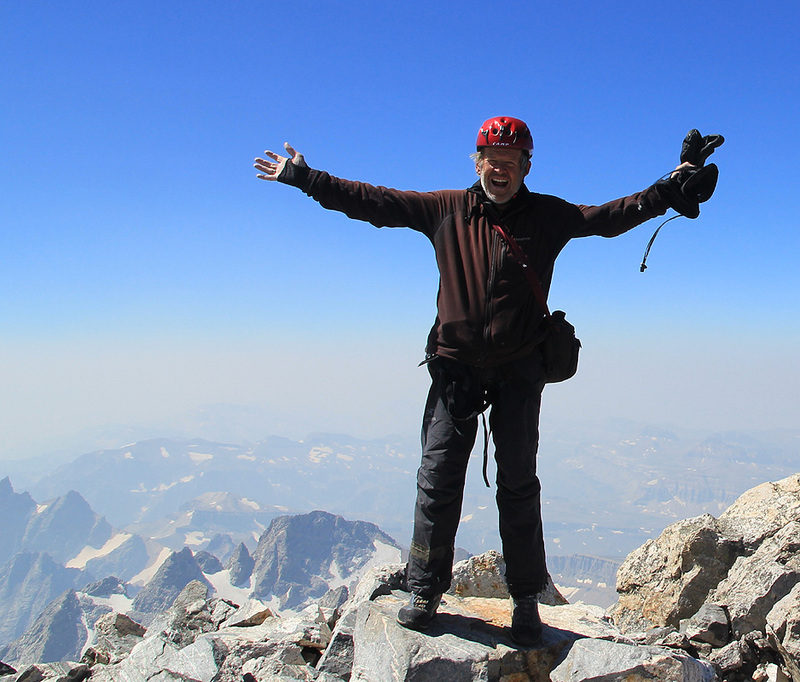 He was certainly a competent guy in all respects and we quickly exchanged some words about climbing in Alaska as well as touching on places/names that we both knew. Drew could inform me about some very good news indeed, we could get upgraded (in this context really move up!) to camp at the Lower Saddle. Exactly what I wanted and had some small hope of achieving. We subsequently reviewed the route and completed the paper work. I thanked him for great service and really helping us, somehow this is much easier on site, than when you try to get such things organized from distant Norway. We now had a full day for rest and general sightseeing, as our hike up to the Lower Saddle could not start until August 1. 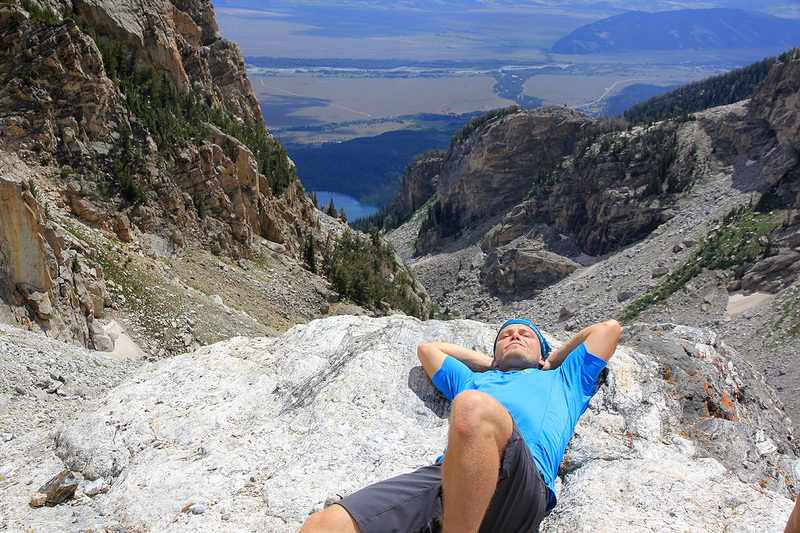 We agreed to stay two nights in Jackson, not exactly a budget town, but very appropriate for everyone as the big rest between climbing the two highest mountains of Wyoming. On the way to Jackson, we first took a small detour north to visit the local medical clinic. 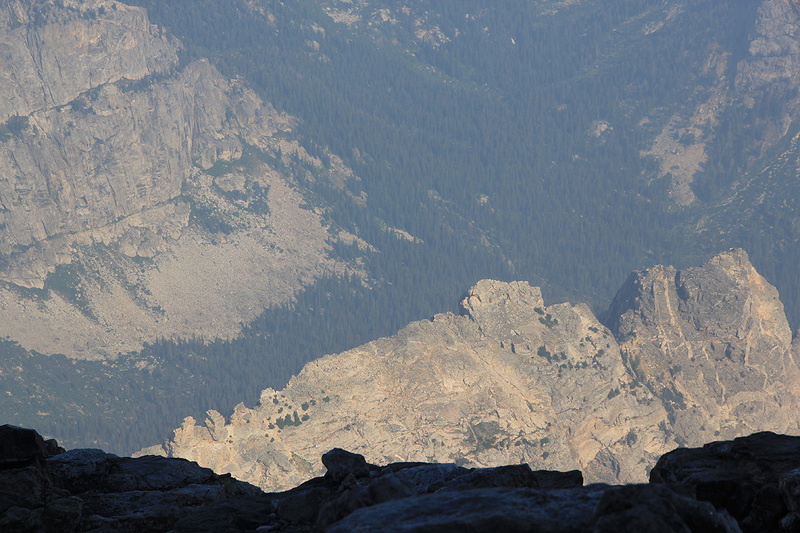 I had a small bump in the middle of my back (unknown cause) that had bothered me slightly on the climb of Gannett Peak. This clinic was just what I needed, one nurse and one doctor almost no bureaucracy and no waiting time. The doctor cleaned out this bump with his knife (slightly painful), and sent with me a recipe for how to treat it in the next several weeks. Rob was subsequently appointed to serve as my personal nurse for the remainder of the trip, a task that he carried out with great skills. The cost was US dollar 300, not bad at all for some needed service. July 31 was our rest day in Jackson. Melanie and Eirik went horseback riding on some local trail nearby. Rob and I had a general day of rest and planning. 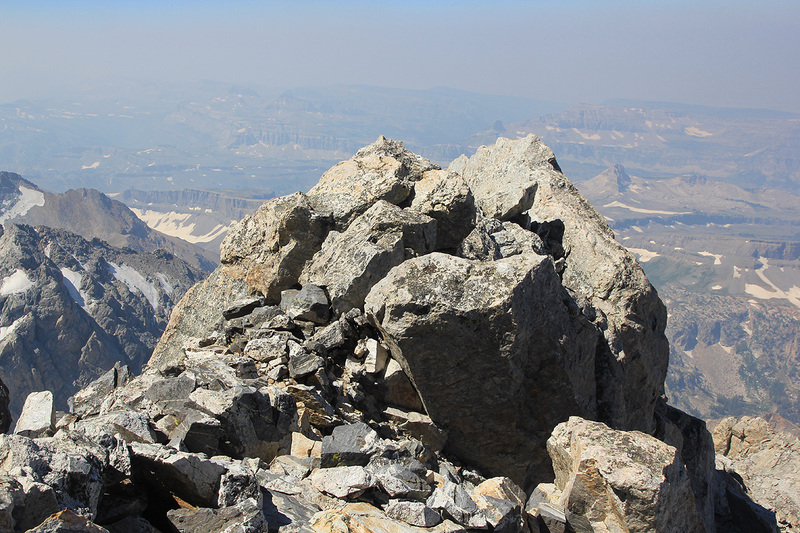 I contacted the Glacier National Park in order to organize our next main objective. 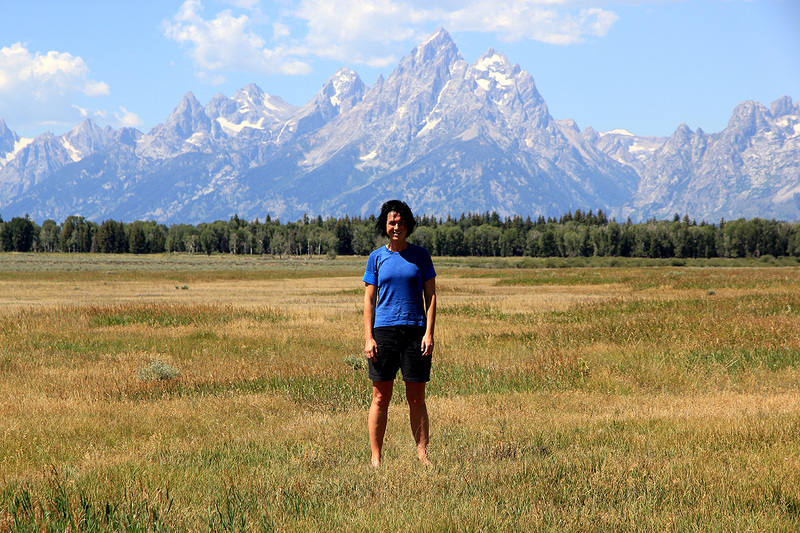 We went shopping and generally planned for the days after Teton. 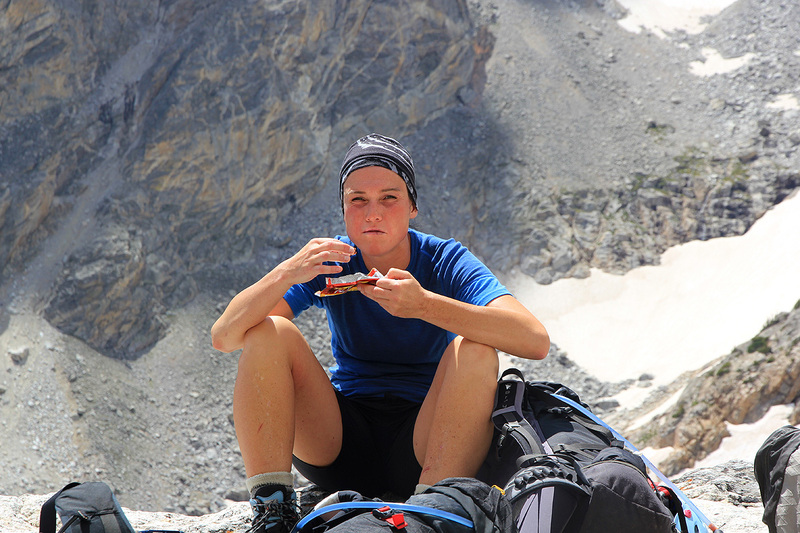 August 1, we had breakfast at 0700 and were generally well prepared and quite a bit excited about getting on with our attempt on The Grand Teton. As we drove towards the trailhead, it was surprising to see dark clouds around the peaks, heavy local showers and thunder moving through. This kind of weather is not exceptional in the afternoon, but at 0800 in the morning - rather unusual. 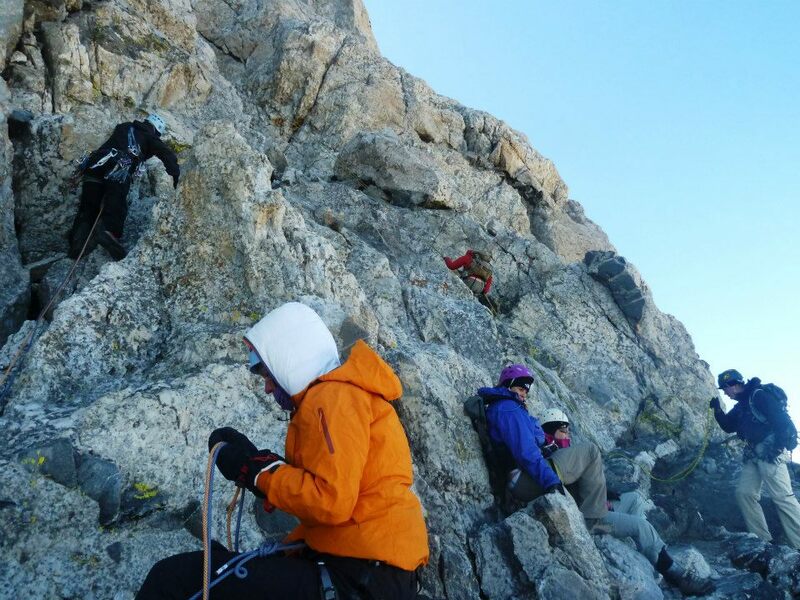 My thoughts went to the climbers high on the mountain starting out with their summit bids this morning. Clearly, many teams would have their plans destroyed by this kind of morning weather. We started hiking at 0830. We were in no hurry, todays goal was the Lower Saddle, no need to rush in order to get there. We had a nice day. We avoided the rain and took time to enjoy the hike and the scenery. We made a navigational mistake when arriving at the Meadows. 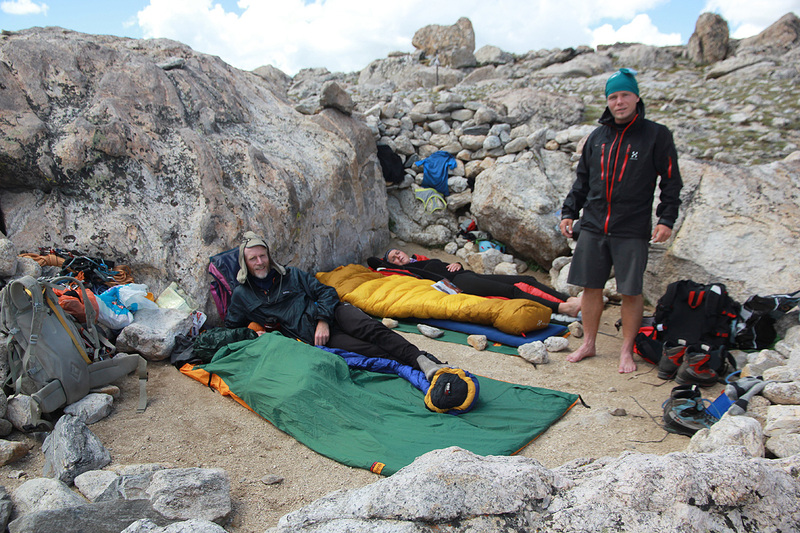 Instead of going right, we went straight through camp and continued up in the middle of the basin. As we gradually lost any signs of a trail while I spotted a very clear trail across to the right, we traversed across and got back on track. I was happy that we did not have to navigate up here in the middle of the night, like people that start from Garnet Canyon. The terrain up on our right hand side was certainly steep. Not easy to go anywhere here. 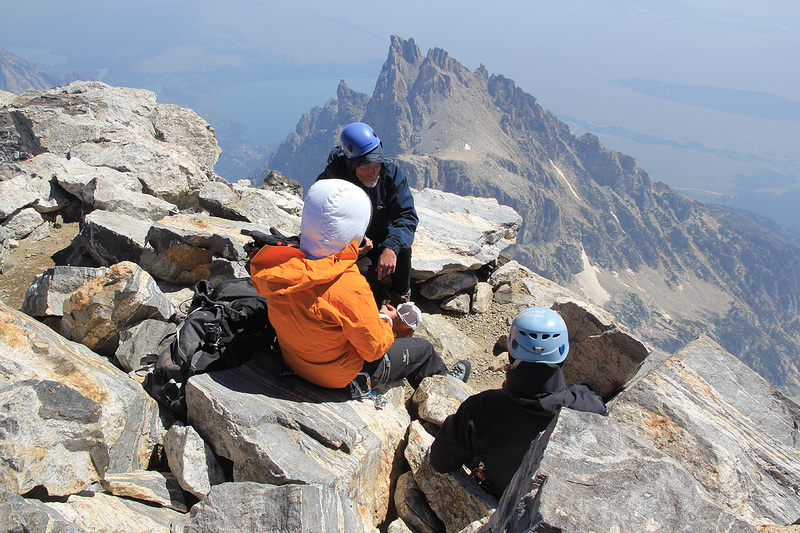 We arrived at the Upper Saddle around 1430, there was still plenty of time left. We found a good and pretty sheltered place for overnight. We had decided to save some weight and did not carry any tent. The idea was that two bivu-bags would serve the purpose. A short stroll and one can look into Idaho. 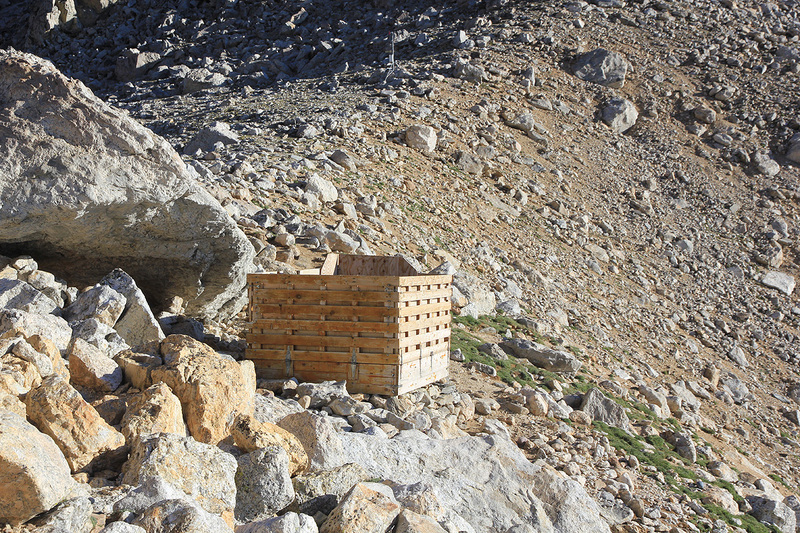 All climbers are told to pee into the neighbor state, this is also where the official toilet has been built. We had dinner, good good sized portions in order to store some energy until tomorrow. 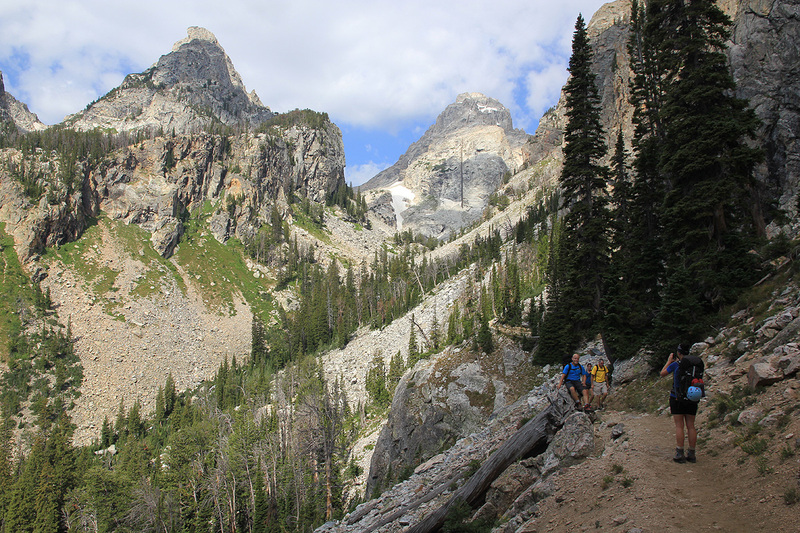 A few climbers that had started late (after the weather improved) started coming down from the Grand Teton. 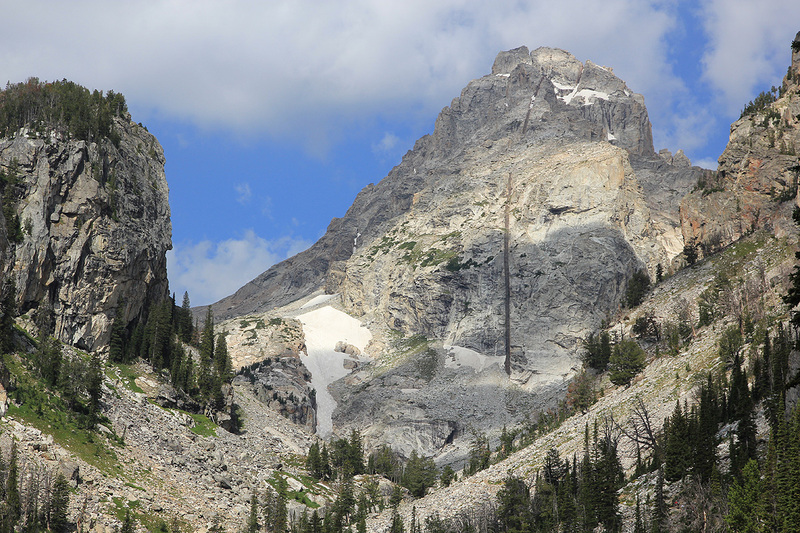 Walking around in the Lower Saddle on such a nice afternoon is very special, every time you look up, there she is - the Grand Teton, a very impressive and somewhat intimidating sight, - climb to this summit tomorrow? Eventually, I also bumped into Drew, the ranger from two days earlier. 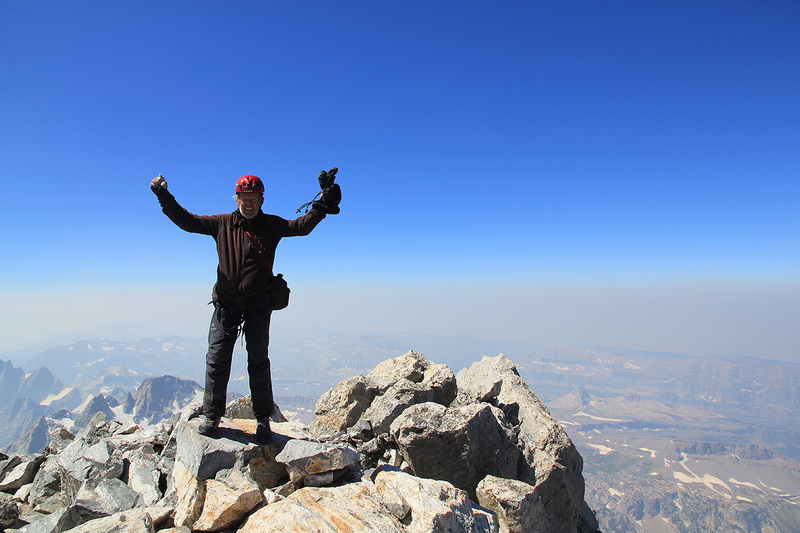 He had started from the parking shortly after midnight and climbed the peak. 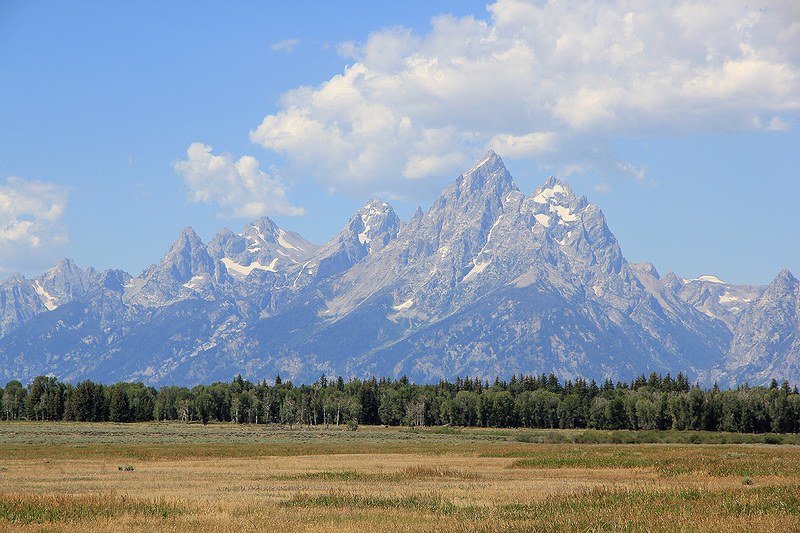 The evening came gradually, the sun set in the west making the Grand Teton cast an enormous shaddow across the flat land going east. 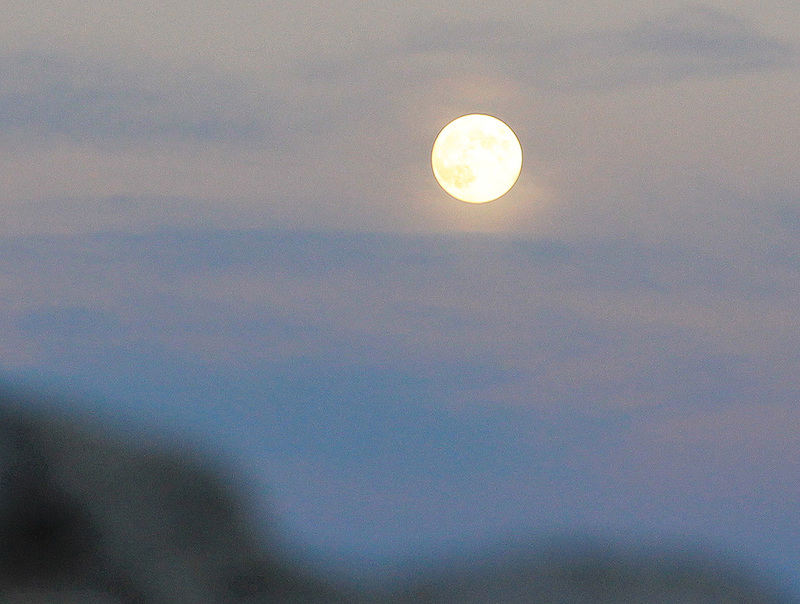 The moon was essentially full, rising over this landscape of sharp mountains, a lasting memory. We slept ok, no more bad weather, the next day looked very promising. We leave at 0630. 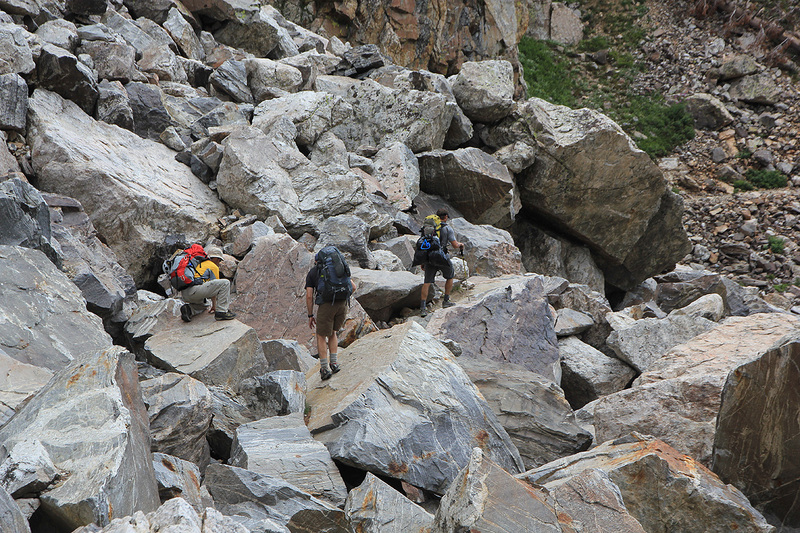 First, up the moraine to the black rock band, then left around the rock buttress. The going gets more challenging after this. It was completely unclear to us where the route actually went. 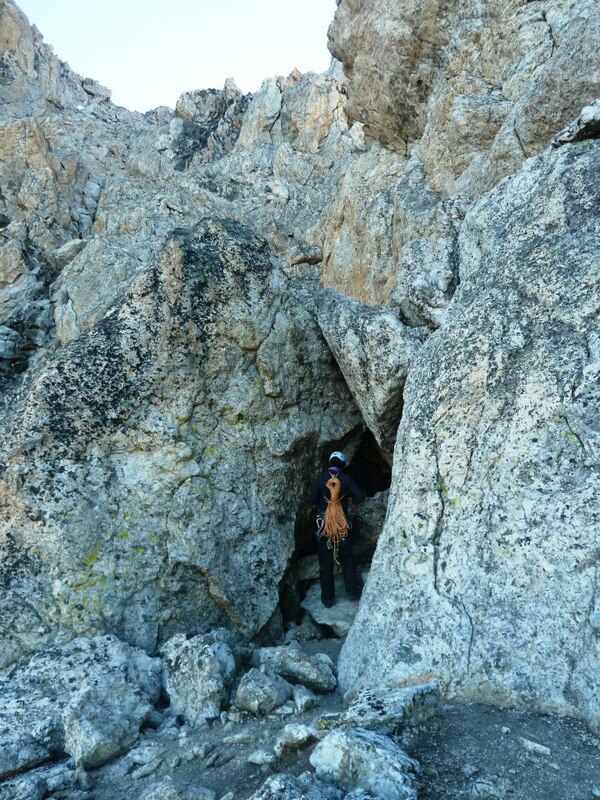 We scrambled up various passages and eventually found the ledge that traversed around the huge rock that subsequently could be tunneled under, "thread the needle" and exit above the wall that we started out below - quite elegant! We got here "off-route", but when following the route on descent, we agreed that our route of ascent had been easier. A lot of (YDS) class 3 scrambling followed and after about 2 hours in steep terrain, we finally approached the Upper Saddle. Above here, the rock gets significantly steeper. 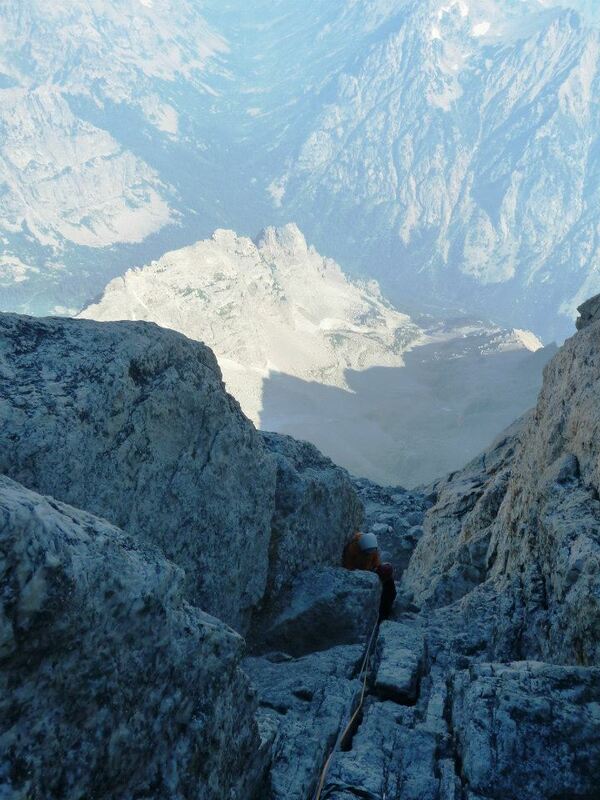 We quickly found the beginning of the Owens Spalding route and Eirik set off on the first pitch. We climbed on 2 half-ropes, Rob and I followed on one, while Melanie came on the second rope. We kept pace with a team of 2 climbers ahead of us, pretty OK given that we were a team of 4. The climbing was enjoyable, quite a change as one moves out in the north-west face. The exposure changes from moderate to quite sensational. The only trouble was an unexpected and very strong wind. I first believed that this wind was the normal wind around sunrise, however, not so. The strong wind continued to bother us throughout the climb. 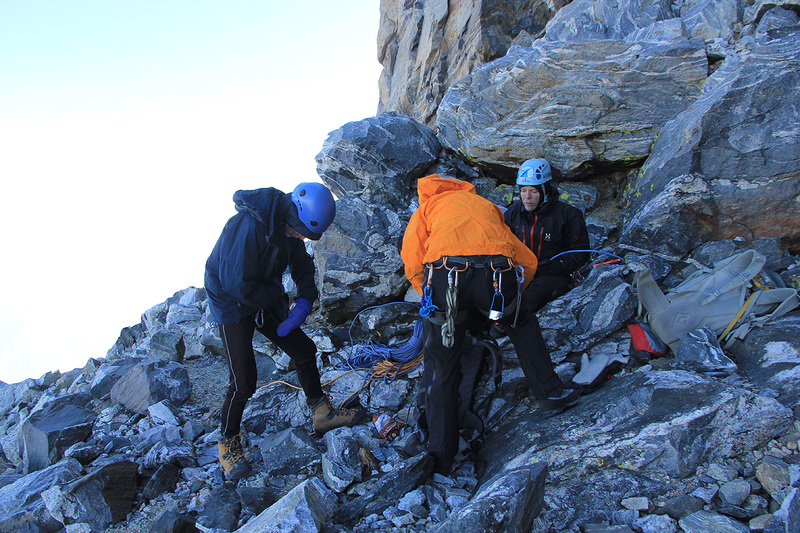 We arrived at the summit at 1140, this included some extra wait before the last pitch, since several teams used the same gully for their abseil. This peak certainly lived up to high expectations. It rises high above everything else. You really feel on top of the world. 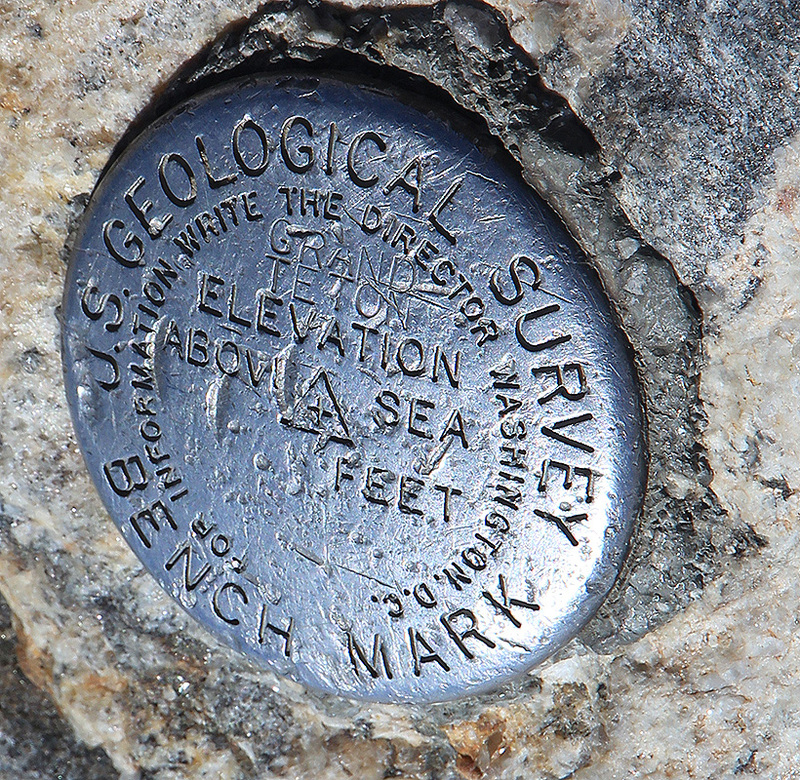 There is a USGS marker at the highest rock. 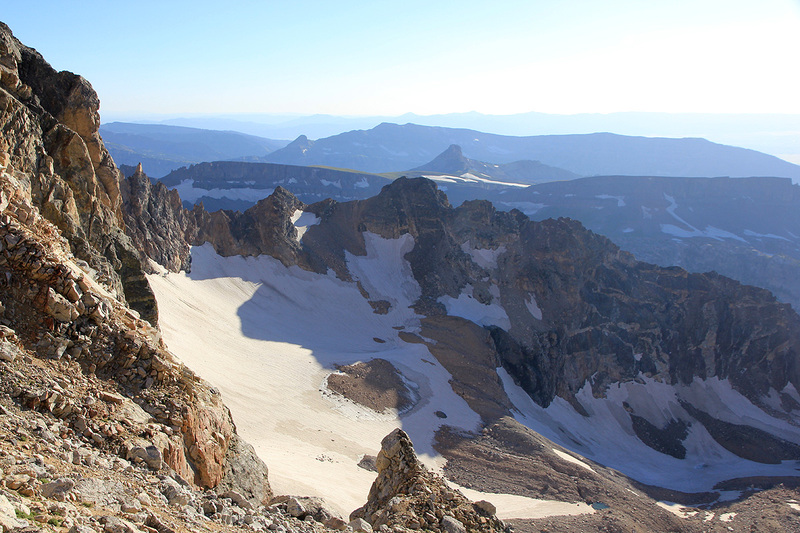 Very nice to be here, the most technical climb of any ultra in the lower 48 states. We rested and stayed at the summit until 1215. The descent went pretty smoothly. We had to wait a little before the last abseil. I used my old figure-eight, but realized at the final free section of the rappell, that new ropes are quite a bit thinner than what they used to be. I descended down the rope at a steady rate, my breaking power could possibly have been a bit better. Back down in the Lower Saddle at 1515. We took a good break and continued downhill at 1550. We have a very nice hike with several stops to collect additional drinking water. We make it back at the parking by 1920. I find that a car has parked so close to the drivers side of our car, that I hardly can enter. The parking area can take hundreds of additional cars. I express my frustration, saying that Wyoming is mostly empty space, so no need to park like this. Rob quietly remarks that the offending car is from Massachusetts.. I guess this explains everything. Thanks to Eirik, Melanie and Rob for making a great team! The entire climb had taken us slightly less than 35 hours, compare this with the recent speed record (car - summit - car) set by Andy Anderson, 2 hours and 53 minutes! 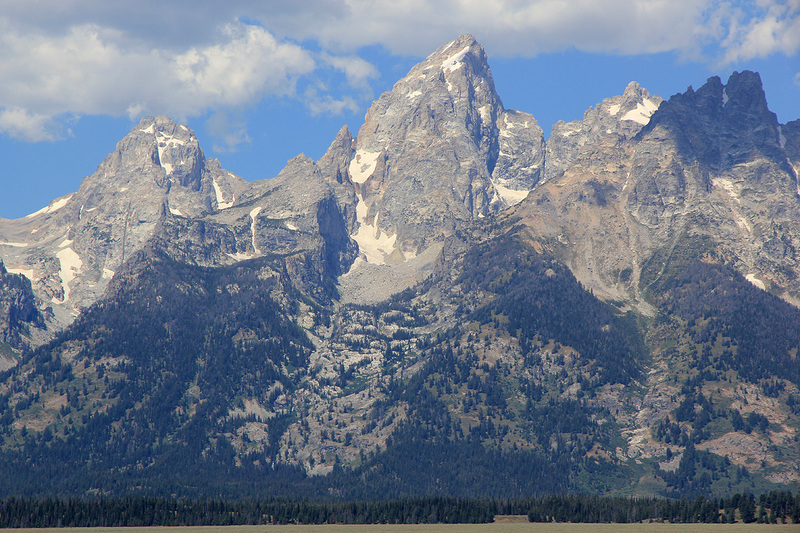 The Grand Teton, first view when arriving on Hwy. 26/287. 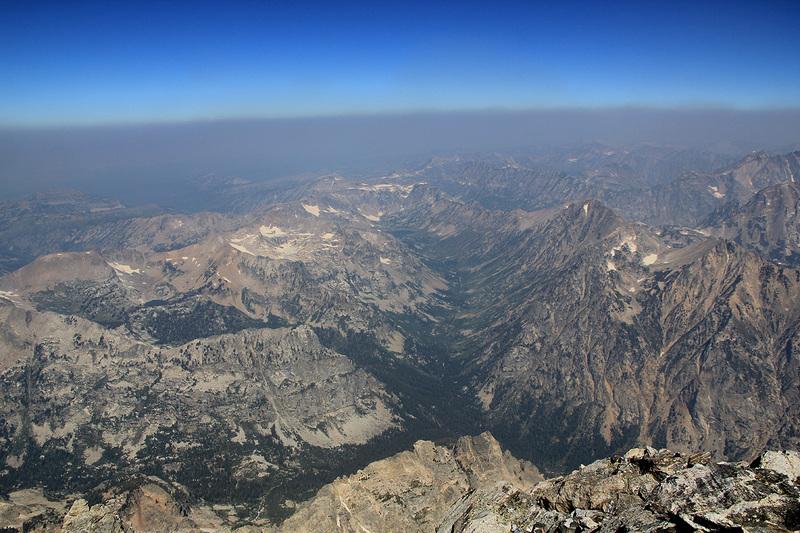 The Grand Teton, from the Lower Saddle.